New Kid has this wonderful color matching puzzle from Kid O. The reason I like it so much is that all the pieces are interchangeable so it was a puzzle he could work on it all by himself at a very young age without getting frustrated. He loved to put the pieces in over and over. Note: this post contains affiliate links to the puzzles we love. Now that he is a little older he has started (but not always) matching the three colors. Then when he gets even older (ah!) he can start matching the pieces by shade. 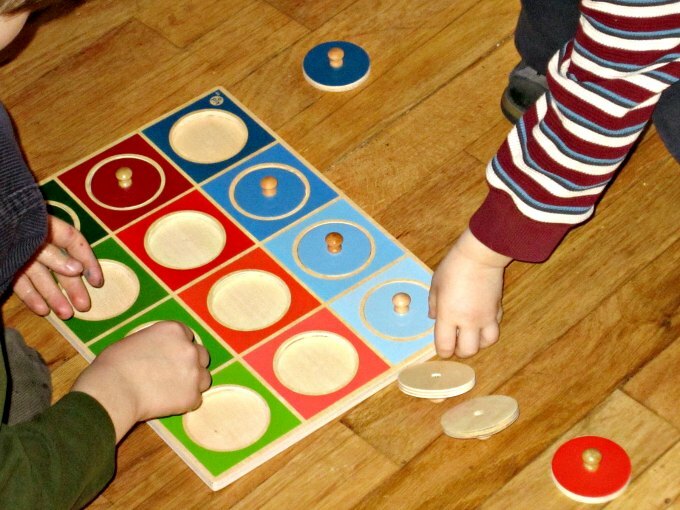 I really like the other Kid O puzzles — very Montessori-ish. We have the narrow to wide puzzle, which New Kid works on with quiet intent, and I think the fraction puzzle also looks great. This post feels a bit cheesy, like I’m trying to sell something. However, this is not a sponsored post, I just think it’s a fantastic puzzle. I always wanted that puzzle and the narrow to wide puzzle. Bt never plunked down the money and now Eleanor is on the older end of the spectrum for playing with it so I probably won't ever do it. I don't think it's at all silly to post products you think are fabulous. In fact we got another kid o product I was thinking about posting. not cheesy at all, how would we find out about cool stuff if you didn't tell us? I've always coveted the *real* Montessori puzzles…like, parts of a flower. I love that there aren't wrong answers with this puzzle. Oh I would love that puzzle in my classroom – we don't seem to have such cool things here in Canada!